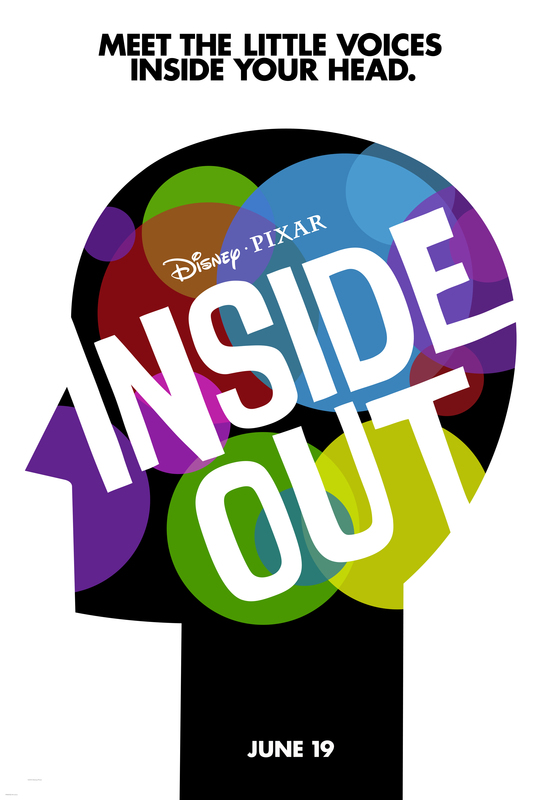 Pixar return with a highly original adventure through the mind of an 11-year old, featuring the voices of Amy Poehler, Phyllis Smith and Mindy Kaling. The Beatles have got a lot to answer for. Not only did they help shape the latter half of the twentieth century. Not only did they change the cultural landscape of the world forever. Not only did they rattle the cages of world leaders. They also influenced animation in ways that only now are revealing themselves. 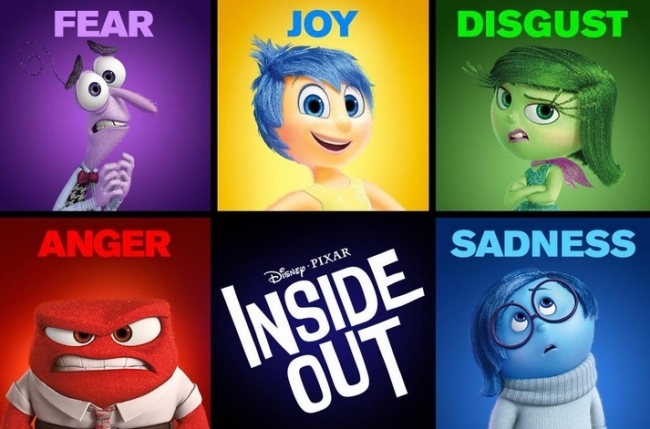 Following on from the excellent Spongebob movie earlier in the year, we have Pixar’s triumphant return to form, Inside Out. Can you tell that I loved it yet ? 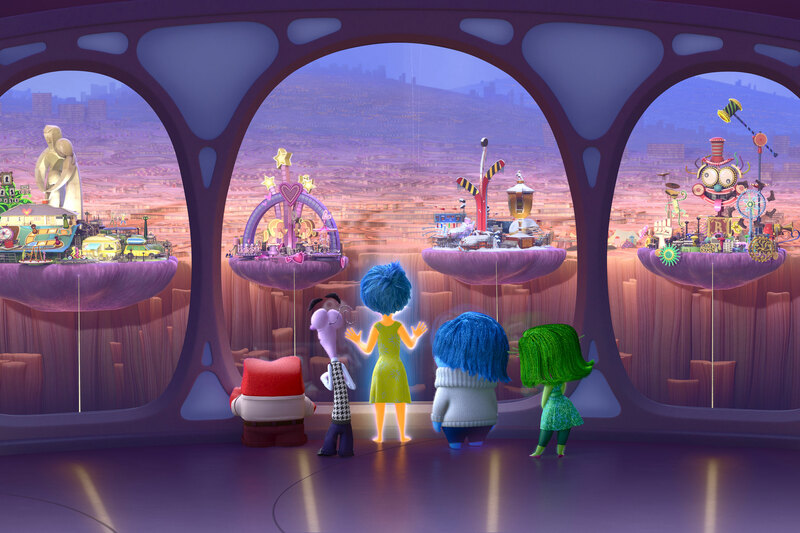 On the surface, Inside Out looks like a quirky family movie centred on the minds of a small all-American family: mom, dad and daughter, Riley. The trailer reveals the innermost workings of all three as they discuss their day around the dinner table. The mother is trying to foster unity and engender a loving and supportive home, the child is surly and unresponsive after a difficult day at school, while dad .. well, he’s drifted off and is currently thinking about football. It’s a telling insight into the minds of the trio and we see what’s actually happening in the heads of all three as we’re introduced – rather bluntly – to the emotions that control each and every one of us : joy, sadness, anger, fear and disgust. And yet the film is less about the family and really all about Riley. 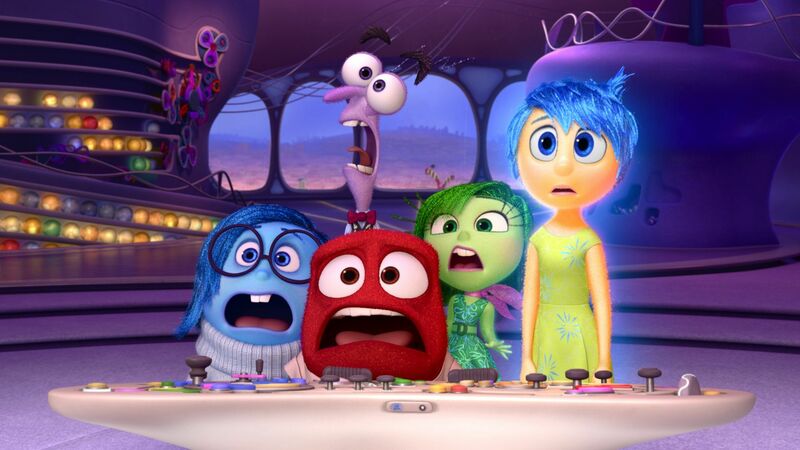 And so it begins … the rollercoaster ride through Riley’s mind, as seen through her five principle emotions. 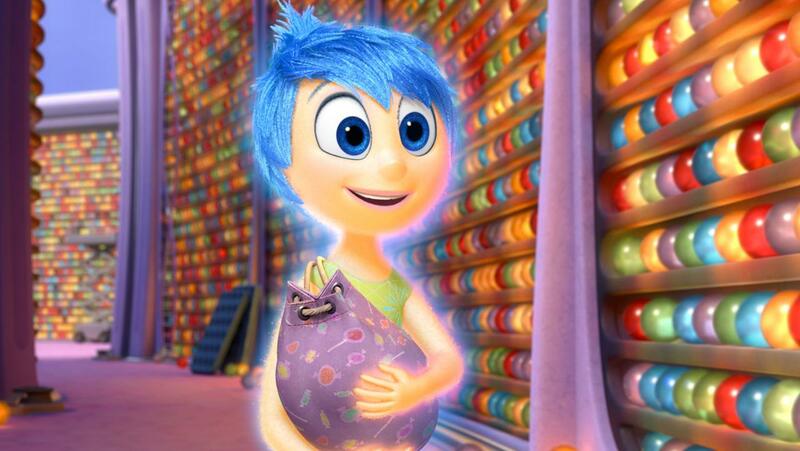 We get to see how memories are stored and filed. We get to meet her imaginary friend, Bing Bong. We discover how we lose certain episodes of our lives over time. We see the bonds that bind us to family, friends, our interests and, in effect, all the little influences that shape our very own personalities. We see them crumble. We see them build again. In short, we see a hell of a lot of that little girl’s mind. The vast majority of the movie takes place inside Riley’s head. By that, I don’t mean it’s from her point of view directly. It’s more about what makes her tick. What happens behind the scenes. How we’re wired. Why we think and react the way we do. It’s a crazy, beautiful, soaring, diving, wayward, complex journey, some of it familiar, some of it completely new, some of it endearing, some of it utterly horrifying. There are moments of sheer terror and others of serene calm. The imagination, thought and creativity that’s gone into this film is .. well, mind-blowing is the only word to describe it because it’s the most apt word possible. There are genuinely heart-breaking scenes where I defy anyone not to well up and throughout the entire picture I found myself being dragged back through my own childhood, reflecting on some of the things that I experienced growing up. One word of warning though : it may too emotional for the very young, so I wouldn’t recommend taking kids under the age of about seven along to see this. Also, if I have one slight criticism it’s that we don’t see much more inside the minds of adults till the – admittedly hilarious – end credits, which do hint very strongly at a sequel. Having said all that, it’s a wonderful family film and will be a big Christmas Day TV hit a couple of years from now. But don’t wait that long … you owe it to yourself and those around you to see it before then. This entry was posted in blogging, Film Review, Movies, Review by rigger67. Bookmark the permalink.